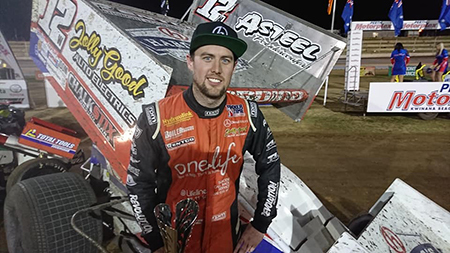 DANIEL Harding won the second round of the Maddington Toyota Triple Crown at the Perth Motorplex on Saturday night. He won the 30-lap feature race from Andrew Priolo and AJ Nash, with the winning margin being 3.091 seconds. Harding took the win after starting P5 for the main event - on the back of being second overall in the Victory 1 Performance Quick Time session at the start of the night - and then taking a win and a third in the heat races. It was a good result for the driver of the HRP Specialties #12 after his early-season campaign was marred by a brutal crash on the Motorplex main straight, seeing him out of action for a while. Harding raced to second early on with Sam Borlini (who started from P1 and was the early leader) and after dropping back to third a couple of laps later, really made his presence felt just over half-race distance, taking the lead and for the most part of the race to the checkers, was unchallenged. The race was only a lap old when an incident in the first turns claimed Mitchell Wormall, Tom Payet, Kaiden Manders and Shaun Bradford, with only Bradford able to get a restart. At the same time Liam Dowling pulled to the infield and quickly lept out of the car with what looked a fuel fire. Nash, who started started from P9, after earlier qualifying third overall and taking a win and an eighth in the heat races, was in front by lap six and was followed by Harding, Borlini and Priolo who had started P13 and had quickly moved up to fourth. Priolo ran a lot of the race in third place and slid up to second on lap 25. This was after he struggled in qualifying and took a sixth and a win in the heats. Priolo only returned from an overseas cruise earlier in the week and was still recovering from a bout of gastro. On lap nine Harding was pushing hard in pits bend and the car quickly became unsettled, which he later said was caused by breaking the ladder in the car’s rear-end. By lap 13 Brad Maiolo, who started from P17, had muscled his way into sixth and was looking very racy. Van Ryt looked like he was going to hold on fifth place, only to pull infield with engine issues with a lap remaining. Jamie Maiolo, who started P7, dropped to ninth at one stage and then ran seventh for a while before a late surge saw him finish fifth. Jason Kendrick, who started P6, dropped to 11th early on and after running a lot of laps in eighth place, he crossed the line in sixth. Jason Pryde was another who moved up a lot of real estate in the main event, started from P16 and taking a solid seventh. Callum Williamson started P18 and was another big mover, finishing in eighth, ahead of Taylor Milling in ninth after starting P15. Shaun Bradford rounded out the top 10 after he started 10th. Borlini held on for 11th from Robert Watson jnr who started from P2, Todd Davis who finished 13th after starting P19, 16-year-old Thomas Callaghan who started P20 and finished 14th on debut and Daniel Hartigan who started P3 and finished 15th. At the start of the show the Victory 1 Quick Time was set by Bradford with a 13.585 second lap that edged out Harding’s 13.740, Nash’s 13.916, Wormall’s 13.938 and Kendrick’s 13.980. Heat wins went to Harding, Nash, Priolo and Watson. The final round of the Maddington Toyota Triple Crown will be held at the Perth Motorplex Grand Final meeting on Saturday, April 13. Harding is leading the Triple Crown points on 284 from Kendrick on 282, Priolo 276 and Jamie Maiolo 276 each and Williamson 260. Heat 1: 1st AJ Nash, 2nd Jason Kendrick, 3rd Jamie Maiolo 4th Shaun Bradford, 5th Jason Pryde, 6th Andrew Priolo, 7th Callum Williamson, 8th Todd Davis, 9th Liam Dowling, 10th Robert Watson jnr. Heat 2: 1st Daniel Harding, 2nd Mitchell Wormall, 3rd Ben Van Ryt, 4th Taylor Milling, 5th Kaiden Manders, 6th Tom Payet, 7th Brad Maiolo, 8th Sam Borlini, 9th Daniel Harding 10th Tom Callaghan. Heat 3: 1st Andrew Priolo, 2nd Tom Payet, 3rd Daniel Harding, 4th Kaiden Manders, 5th Daniel Hartigan, 6th Callum Williamson, 7th Taylor Milling, 8th AJ Nash, 9th Jason Pryde, DNF: Liam Dowling. Heat 4: 1st Robert Watson jnr, 2nd Ben Van Ryt, 3rd Jamie Maiolo, 4th Sam Borlini, 5th Mitchell Wormall, 6th Jason Kendrick, 7th Brad Maiolo, 8th Shaun Bradford, 9th Todd Davis, 10th Tom Callaghan. Feature: 1st Daniel Harding, 2nd Andrew Priolo, 3rd AJ Nash, 4th Brad Maiolo, 5th Jamie Maiolo, 6th Jason Kendrick, 7th Jason Pryde, 8th Callum Williamson, 9th Taylor Milling, 10th Brad Maiolo, 11th Sam Borlini, 12th Robert Watson jnr, 13th Todd Davis, 14th Tom Callaghan, 15th Daniel Hartigan. DNF: Ben Van Ryt, Liam Dowling, Mitchell Wormall, Tom Payet and Kaiden Manders. Maddington Toyota Triple Crown (after 2 of 3 rounds) top 20: Daniel Harding 284, Jason Kendrick 282, Andrew Priolo 276, Jamie Maiolo 276, Callum Williamson 260, Kaiden Manders 250, Jason Pryde 248, Tom Payet 236, Mitchell Wormall 232, Todd Davis 230, AJ Nash 194, Brad Maiolo 192, James McFadden 150, Kerry Madsen 146, Brooke Tatnell 142, Glen Sutherland 138, Taylor Milling Ben Butcher 132 eadh, Shaun Bradford 130, Sam Borlini 128.